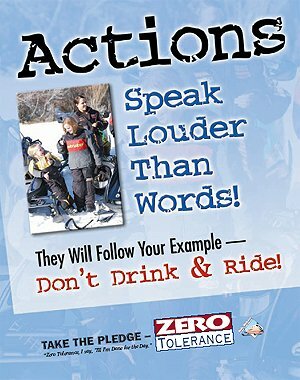 Individual behavior and responsibility is the key to making snowmobiling safe. It is always a good time to remind snowmobilers to take charge of their own safety while riding. Snowmobiling is a fun, family-oriented recreation enjoyed daily by thousands of people in the snowbelt region. Snowmobilers need to be prepared while planning their trip. Never ride alone – and always leave a plan with family or friends before you leave. It is important to be sure the snowmobiles are in top running condition before you head out. Know Before You Go! No ice travel is ever completely safe. Be sure to check the ice conditions before you go. Slow Down at Night! Night riding requires extra precautions. It is important to ride at slower speeds and use caution to not override the snowmobile’s headlights. Snowmobiling and Alcohol Don’t Mix! Have fun on your run – but don’t drink until you’re done riding for the day. Stay to the Right! When riding on trails, always anticipate oncoming traffic and stay to the right. Ride Safe So You Can Ride Again! December 1st~ Sponsored by the Frankenmuth Snowmobile Club from 8:30 a.m. until 2:30 p.m. at the Frankenmuth Conservation Club, 8415 E. Curtis Rd., Frankenmuth MI. For information contact Ed Roedel at 989-262-8252. December 1st~ Sponsored by Benzie Manistee Snowbirds from 9:00Am – 3:00PM at Snowbirds Club House 14121 Industrial Ave Kaleva Mi 49654 For more information call Mark Coe @ 231/944-0678 or Jeff Petrosky @ 231/510-2622. Lunch will be provided by the club. Please keep checking back for current class schedule.